Materials in the Len Milde Collection are housed in the Closed Collection of Special Collections. If you wish to view items in the Milde Collection, it is best to make an appointment by emailing or calling ahead (spcoll@appstate.edu, 828-262-7974). For hours and other information about using items in the Closed Collection, go to the Special Collections Research Services page. Motorsports writer and photographer Leonard "Len" Milde (1916-1985) covered races throughout the Midwest and wrote a regular column, "It Seems to Me," for Illustrated Speedway News. The Ohio native was elected to the National Auto Racing Hall of Fame. The photocopies of the twenty letters in the collection were donated by auto racer and historian Don Radbruch, who was a great friend of the Stock Car Racing Collection. Several of the letters are from race driver Mel Hansen (1898-1963), who competed in midget and Indycar races. Box 1. Folder 1. Letters. 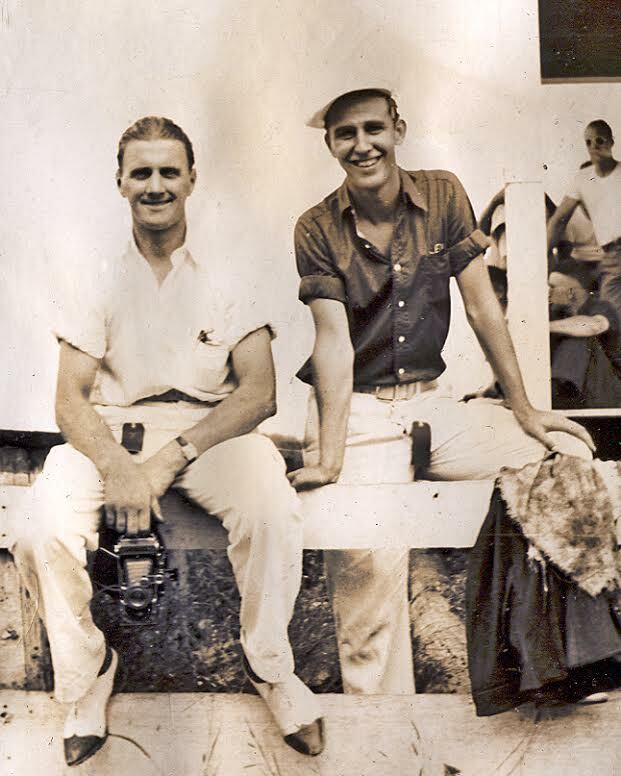 Len Milde, right, with Al Blixt in 1940. Photo copyright Al Blixt Collection, courtesy of Al Blixt, Jr.